I got into babywearing with N quite late - she was already about 18 months old. During this time, Buding's new product - Saya - was introduced and I lined up to be one of the first customers. I purchased the SSK Brown Floral, replaced my existing pouch and happily wore N until my back couldn't take it anymore. Now that E is a little bigger, I have started using the Saya for him and E is loving it the same way his Achi did! took the Ruxpin for a spin! Partners Bianca Araneta-Elizalde and Buding Aquino-Dee both agree that the best place a baby should be is in the loving arms of mommy. Having said this, the ancient art of Babywearing is something both of them dutifully practice. Buding is no stranger to the babywearing scene. She is the brains behind the well loved SaYa baby carrier and is also the creative designer of a beautiful line of Blissfulbabes pouches. 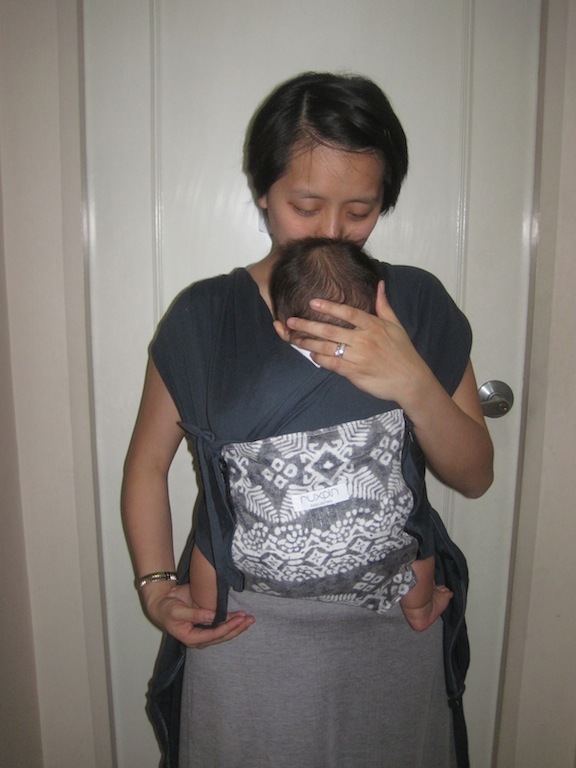 Bianca, who is the maven and muse of Eden Designlab Intl., has been an avid babywearer since day one, long before babywearing has been in vogue locally. It is to her credit that the word "RUXPIN" was coined. Filled with beloved childhood memories, Bianca now immortalizes one of her favorite characters by paying homage to TEDDY RUXPIN. He was an adventurous talking teddy bear who rose to fame in the 80's capturing the hearts of many boys and girls who enjoyed the books in tape and animated tv show series. Dubbed as the "thinking child's Care Bear", it was through one of the books that Bianca first heard a term that relates to babywearing, the word "marsupial". Teddy Ruxpin answered the question "Are Koalas Bears or Not?". So, at a very young age, Bianca nurtured her knowledge and love for animals while widening her vocabulary as well. Fast forward to today, both these pioneering women are bursting in the seams with excitement to unveil their latest collaboration…a luxe line of baby carriers that will reinforce the Babywearing boom. The Ruxpin line is a collection of wonderfully crafted and thoughtfully designed carriers. Their signature product is the Ruxpin Mei-Tai, which is a traditional carrier spruced up with a lot of pretty and practical features that will make it appeal to every modern mama. They are also offering the Ruxpin Hybrid (Double Ring) Sling, which is a cross between a ring sling and a wrap. The carriers will be informally unveiled and launched at the Babywearing 4 Meet this Saturday. 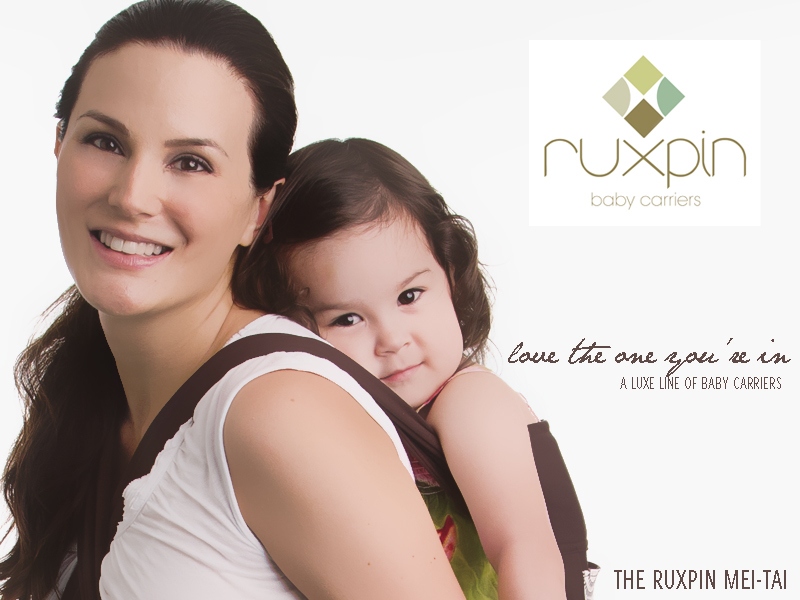 Stay tuned for more details about this wonderful line of carriers that caters to the different stages of Babywearing to suit every need and lifestyle. Simply put, Ruxpin --- "Love the One you're In".